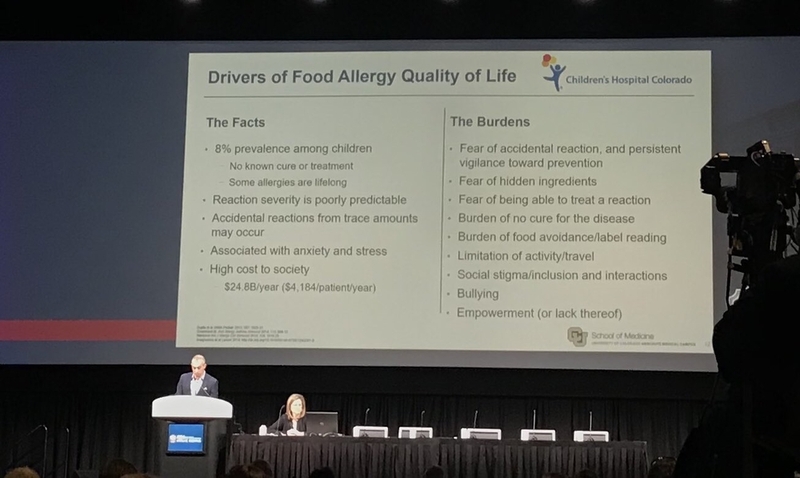 San Francisco, CA – A lot of questions remain about long-term allergy outcomes following immunotherapy. A new study presented at the 2019 American Academy of Allergy, Asthma & Immunology (AAAAI) Annual Meeting has found that the ability to incorporate peanut food equivalents into the diet is maintained years after completing food immunotherapy. Fifty-five past participants in peanut immunotherapy trials were enrolled in a longitudinal observational study. Peanut food equivalent ingestion and associated reactions were reviewed for patients who had completed either oral or sublingual immunotherapy from 2010 until 2017. The majority of patients (89%) were continuing to ingest peanut at the time of follow-up. Adverse reactions and taste aversion were the most cited reasons for discontinuation of peanut ingestion. Of the participants remaining, 74% consumed peanut daily. While 23.8% of patients reported reactions including gastrointestinal symptoms and urticaria (also known as hives), most symptoms could be treated with antihistamines. One reaction required epinephrine and two required emergency medical services. There was no correlation between the amount of peanut food equivalent ingested and the likelihood of a reaction. Participants in sublingual immunotherapy trials on average consumed less peanut than those enrolled in oral immunotherapy trials. Oral immunotherapy patients were more likely to report adverse reactions. Carol, you're certainly NOT a bad mom ... and so very far from being an idiot! Not every treatment for ANY disorder, including food allergies, is right for every person. Each family has to figure out the benefits and risks that are unique to their own situation. You're being careful and doing your due diligence and making the best decisions for your family. Articles about OIT in the news has been the bane of my existence. Every single new person I meet and tell about my son’s food allergies brings up OIT like I’ve never heard of it. And they dismiss his allergies like if I would just do OIT for him, he would be magically cured. Implication is that I’m either an idiot or a bad mom. As you all know, there are a lot of caveats with these studies. And OIT is nowhere near ready for prime time, as in everyone being able to do it or be cured by it. My son is not a candidate at this time for many reasons. To me, this was the most important slide from the entire conference. “No cure.” These are the top experts saying that - at this time anyway - there is no cure for food allergies. I think I need to have it printed on an index card and carry it around with me so I can show it to the people who bring up OIT. I know people are just trying to be helpful but we’ve been dealing this for 13 years and I think I know just a bit more about than your average bear.